Volunteers Deb and Doug Brown are awarded gold tenure pins during the Blue Spring Manatee Festival in 2018 to recognize and honor three decades of remarkable manatee advocacy. 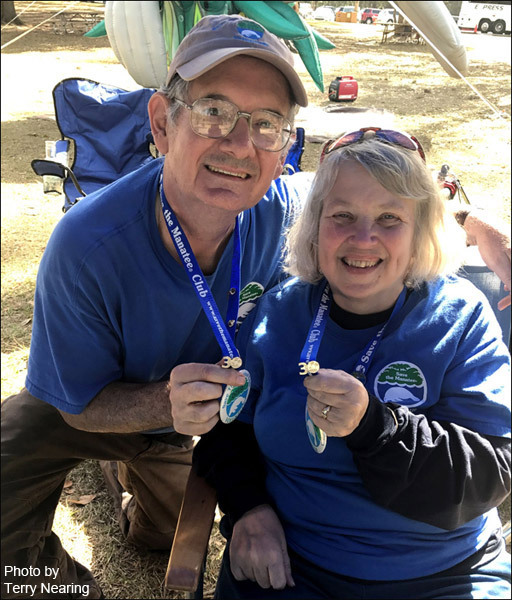 It was a great pleasure this past winter (2018) to present stellar Save the Manatee Club volunteers Deb and Doug Brown from Lake City, Florida, with 30-year tenure pins in recognition of their outstanding dedication to our organization and the manatees. Steadfast through the years in their volunteerism, Deb and Doug give manatee presentations, attend public meetings, and assist at fundraisers. They even built their own manatee table display and created an interactive puzzle for tabling events. 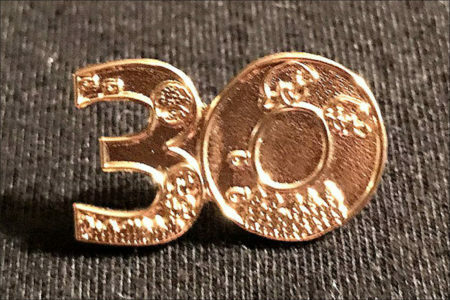 The pin for Save the Manatee Club volunteers who achieve 30 years of service. The Browns claim what drives them is the desire to help manatees and other animals that can’t speak for themselves. They take on enough for three to four volunteers but wish that more volunteers would step up and take part. They welcome opportunities to train new volunteers, aware that a time will come when they can no longer do it all themselves. Thank you to the Browns and all of our exceptional volunteers for your time and efforts devoted to helping the manatees.